Marvelous Multiagers! 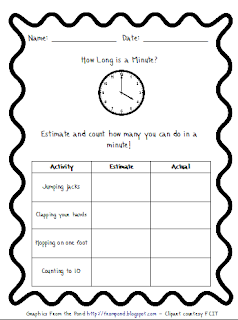 : How Long IS a Minute? In first grade, we're starting our math unit on time. I love teaching time because they can apply their new knowledge all day long at school! Today our lesson was about understanding the minute. The first thing I had them do was close their eyes and raise their hand when they thought a minute had passed. When I first explained this to them, I said, "So today we are going to learn how long a minute is." And one girl said, "A minute is 60 seconds." Wellllllll okay then, thanks for ruining the activity! Haha! We still did the closing eyes thing. One girl raised her hand after 10 seconds! A couple people raised their hands after about 30, and everyone else counted to 60! Cheaters! Here's the sheet I typed up! If you can use it, let me know! On the back, we estimated and then wrote as many numbers as we could in a minute. Most of the first graders thought they could write all the numbers from 1-100, however, they were sad when they only got to 20 or 30! Ooooh! I love this idea, it's such a great way to begin a time unit! I will definitely do this with my kids and let you know how it goes. Thanks for sharing! Cute freebie, I will use it for sure! I'm a new multi-age follower :) Come on over for a visit! Yes! I can totally use this!! THANK YOU!!! Kids just don't understand time. It's funny! !